In order to accommodate the growing number of book and video review requests that Bridges4Kids receives, we have formulated a panel of parents and professionals to assist in the review process. Click here for the first set of reviews. Click here for the second set of reviews. Click here for the third set of reviews. 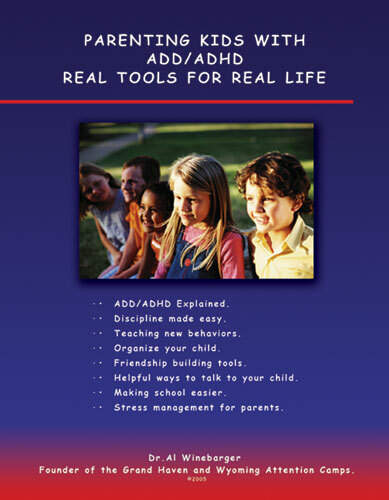 Author: Dr. Al Winebarger, Ph.D.
Holly's Review: This is an amazingly insightful manual on how to raise your child with ADHD. Dr. Al Winebarger touches on every aspect of helping your child in school and at home. There is even a chapter on stress management for parents. This is a wonderful book, as it does not stress medication. Like the title says, it contains 'real tools for real life'. The ideas in the book are based on a common sense approach to learning, are not hard to follow, and will help everyone in the family. Great book! For More Information: Dr. Al Winebarger is a Clinical Psychologist in Grand Rapids, Michigan. Learn more about Dr. Winebarger at www.westernbehavioral.com or call 616-842-4772. Jackie's Review: In the book KIDS LAW, Attorney John W. Biggers combines years of experience and a passion for children to make a once difficult topic transform into an easy-to-understand, enjoyable read. Biggers explains everything from the crime to the arrest and from the trial to incarceration. Includes a comprehensive glossary of terms. I would recommend KIDS LAW to anyone who is hoping to navigate the complexity of the Juvenile Justice system. Intended for students and those who work with them, KIDS LAW makes an excellent addition to any school library, classroom, or in the home as a study resource. A teacher's manual is also available. Crystal's Review: The author succeeded at writing a textbook-style overview of the juvenile justice system covering everything from how courts assist juveniles who are not adequately cared for to how the justice system handles youth who do not follow established laws. Besides providing general information on juvenile justice, the author argues--quite convincingly--that juvenile offenders must be treated as children rather than as adults. He also focuses heavily on the idea that individuals must work together to confront problems specific to their communities in order to effectively protect juveniles and to prevent them from falling into a pattern of criminal activity. For More Information: Attorney and Youth Advocate, John Biggers, has worked closely with kids, parents and other adults in the Juvenile and Adult Courts for over 30 years. To purchase the book, or for more information, visit www.kidslaw.com. Jackie's Review: Autism: Heartfelt Thoughts from Mothers is a beautiful compilation of personal stories from mothers of children with autism. The stories contain words of wisdom, details of challenges that each mother has faced, ways they feel that they have been blessed, and resources that they found useful during their journey. Readers will gain insight into the world of Autism, as experienced first-hand by moms from around the world. There are stories in this book that will make you laugh and cry...there is something for everyone. The raw human emotion is a refreshing alternative to the drab textbook versions of what parents might expect during their child's lifespan. Individuality, uniqueness and compassion prevail in this book that proves that one size does NOT fit all. As I neared the end of the book, I arrived at a page dedicated to Ryan Long, who unexpectedly passed away. I was overcome with emotion while reading the words penned by his mother on the first anniversary of his passing. As the parent of a child with autism, it is a life changing moment when you realize that you're not alone, and that there are others out there who dream, laugh, grieve, and cry...just like you do. Cammy's Review: I really enjoyed reading this book and seeing the photos of mothers with their child. Each were special and unique and each mother showed unbelievable strength, courage and determination in raising their child. I felt like I got to know each child personally, just through the astounding love and devotion these mothers have for their children. I commend these mothers to the fullest extent for having such positive attitudes and hope for the future. After reading this book, I became more grateful for my life and everyone in it. These mothers face far more challenges than I ever have and yet they have a positive outlook and are grateful for being the ones chosen to raise and care for their child with autism. I also learned that there are many forms and degrees of severity of autism. Reading this book helped me understand autism and the effects it has on the whole family. I recommend reading this book to open your eyes about autism and to read about the awesome dedication that these mothers have for their children. It truly is a "heartfelt" book. For More Information: Judy Lynne is the proud mother of a 21-year-old daughter with Autism. She is a dedicated parent advocate and former President of her state's Autism Society. Andrea's Review: “Sanity Savers” by Sharon McDonald contains a potpourri of ideas for making teaching easier and more fun for teachers and students alike! It is chock full of suggestions for everything from smoothing out transition times to removing tempera paint from clothing. This book would be particularly beneficial for new teachers. It provides some basic information (introducing centers one at a time at the beginning of the year) along with some suggestions even seasoned teachers might not have thought of (using a chalk line to prevent ants from intruding on a picnic). Many of the ideas in the book can be adapted to a home setting as well! The author’s 28 years of teaching experience provides readers with a wealth of useable information for making classrooms more effective and enjoyable! For More Information: Sharon MacDonald has been training teachers for over fifteen years throughout the United States. She trains on a variety of early childhood topics, based on years of classroom experience. With a Masters in Education, Sharon has taught ages ranging from three-year-olds to adults, and has taught an inclusion program for children with disabilities. For more information or the purchase the book, visit www.gryphonhouse.com. Amie’s Review: This book is a “must read” for all who work with families of preemies or special needs children. No matter how much we care about our families, or how much experience we have with working with special needs children, we can’t fully understand the journey these parents take. Reading this book is the closest I’ve come to beginning to understand what kind of an emotional roller-coaster ride these families go through. This father’s candid story about dealing with his son’s health, doctors, hospitals, insurance companies, home visiting nurses, therapists, early intervention teachers, family, friends and strangers was a humbling experience for me. Stimpson uses a diary format that reads very quickly. Although the subject matter is heavy, he shares the highs and lows with honesty and humor. To see this child through the eyes of his parents and his early intervention team at the same time was a valuable reminder to me about the kind of service person I want to be. We have the utmost respect for all of the families on our caseloads, but it is difficult to keep in mind that they all have their own individual stories. Because we like to help, we offer lots of “shoulds” and “musts” and wonder why families don’t always follow through. This is a wonderful reminder about how and why parents pick the battles that they do. For More Information: To order, call 1-800-621-2736, and mention code "ALEXFLYER" for a 20% discount. For further information about the book or author, please contact Ann Avouris at publicity@academychicago.com or 1-800-248-READ (7323). Penny’s Review: Eating Gluten-Free with Emily is a children's book that not only explains a gluten-free diet, but also details Emily's digestive symptoms and the route from doctor to blood draw to scope to get the diagnosis. The illustrations are colorful and cute. The story, which is told from Emily's perspective, explains celiac disease in a way that children understand, and gives examples of what foods contain gluten and which ones do not. Emily also explains how she deals with real-life situations, like camp and birthday parties. My favorite line in the book comes from Emily and her mom when they question restaurant staff: "We say, 'We are gluten detectives. Answer the questions, please.'" This book has been helpful to my family in two ways. My five year old daughter is autistic, and has been on a gluten free/casein free diet for four years, and it has given her twin brother and older sister a perspective of what a special diet is like for their sister. Additionally, my elder daughter is about to see a pediatric gastroenterologist, to rule out (or in?) celiac disease. This book has given us a wonderful opportunity to talk about the process of going to the doctor and making dietary changes. Seven year old Mikalea tells me she thinks this book is good because it shows that Emily is just a regular kid who needs to eat special food. Ordering Information: To order, visit Amazon.com and enter "Eating Gluten-Free With Emily: A Story For Children With Celiac Disease" into the search box or click on the link provided here: (http://www.amazon.com/exec/obidos/tg/detail/-/1890627623/qid=1113500904/sr=8-1/ref=sr_8_xs_ap_i1_xgl14/102-0494800-1895321?v=glance&s=books&n=507846). Jackie’s Review: This book, written by A. Jean Ayres, is a must-have for those living or working with children who have sensory processing issues. This compilation of years of letters and stories between A. Jean and her nephew, Philip Erwin, is heartfelt, uplifting, and inspiring. 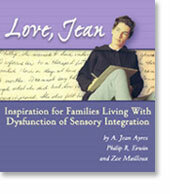 Love, Jean contains insight that is sure to help parents avoid common pitfalls and misunderstandings associated with the treatment of sensory integration dysfunction. Ordering Information: To order, visit http://www.crestport.com/lovejean.html and click on "order" at the top of the page. About the Authors: A. JEAN AYRES, PhD, OTR - About 50 years ago, A. Jean Ayres, working as an occupational therapist with neurologically disabled children and adults, began to realize that the weak muscles and poorly coordinated hands and legs of these clients were not always their most severe handicaps. Her approach with these children differed from that of other professionals, for she believed that the best answers would be found in a better understanding of how the brain processes sensations - from not only the eyes and ears but other parts of the body as well. She is credited with founding the field of sensory integration. Dr. Ayres earned advanced degrees from the University of Southern California and undertook post-doctoral work at the Brain Research Institute at the University of California at Los Angeles. She was on the faculty of the University of Southern California for over 20 years. She is the author of Sensory Integration and the Child, Sensory Integration and Learning Disorders, and the Sensory Integration Praxis Tests. PHILIP R. ERWIN - Mr. Erwin received his bachelor's degree in Philosophy from the University of Oregon and certification from the Einstein School of Medicine's Institute of Emergency Medicine and the International Yacht Restoration School. Prior to advancing his career as a writer and shipwright, he taught wooden boat restoration at the International Yacht Restoration School and served as a paramedic and emergency medical technician in New York, Connecticut, California, and Oregon. ZOE MAILLOUX, MA, OTR, FAOTA - Ms. Mailloux is nationally and internationally recognized within the profession of occupational therapy in the area of sensory integration theory and practice. She is currently the Director of Administration at Pediatric Therapy Network, a non-profit children's therapy center serving over 1000 children and their families. She was a research assistant to Dr. A. Jean Ayres from 1978 to 1984 and was involved in many clinical and research projects with Dr. Ayres. In addition, she has published numerous journal articles and textbook chapters on these topics. Ms. Mailloux was the chairperson of the Sensory Integration Special Interest Section of the American Occupational Therapy Association from 1993 to 1996 and was named a fellow of this organization in 1993. Jackie's Review: Reviewing “Planning for the Future” was a real educational experience. 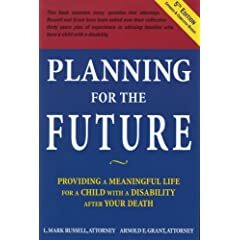 I have never seen so much information in one place about future planning for a child with a disability. The first section blew me away - the second and third – same thing. From cover to cover I was constantly learning something new. After finishing the remaining pages in this whopper of a book (which is 642 pages in length), I am happy to report that this was an extremely fruitful investment of my time. I now have the knowledge that I need to move forward in planning for my own child’s future. I plan to consult its content for many years to come. The authors cover everything from the differences in housing options to applying for SSI to caregiver options to community living to managing finances to specifying your child's joys so that they may continue after your death (even down to writing a letter which specifies that your child likes to bowl or go to the movies). Great care was taken to ensure that caregivers could understand the intended message. The lesson was never overshadowed by meaningless 15-letter words or trendy phrases. Over and over again, the authors stressed how important it is to get input from the person with the disability and to tell the people who you expect to care for your child about your decisions, which may involve them. Readers are prodded to write a "letter of intent" and to revise it each year so that it's always current and changes with the needs of the child. The book is expensive (when compared to the average novel or hobby book) but if you're looking into this topic, I would highly recommend making this purchase before consulting an attorney or hiring someone blindly. After all, planning for the future of a child with a disability is no simple work of fiction. Happy reading! For More Information: This book can be ordered by calling 1-800-247-6553 (credit card only). You can also visit Amazon.com at http://www.amazon.com/exec/obidos/tg/detail/-/0912891203/qid=1125945610/sr=8-1/ref=pd_bbs_1/002-4446099-0620033?v=glance&s=books&n=507846 for more information or to purchase this book. About the Authors: L. Mark Russell, who has an older brother dual diagnosed with a mild intellectual disability and mental illness, has concentrated his law practice for over fifteen years on estate planning for families who have a child with a disability, advising hundreds of families. He is a nationally recognized conference speaker, regularly speaking to national, state, and local disability organizations across the country, including seminars for Public Television. Arnold E. Grant is a partner in the Chicago office of McGuireWoods LLP, a nationally recognized law firm with more than 700 attorneys. Mr. Grant has been named a member of the leading lawyer network, which is a peer selected listing of the top 5% of the lawyers in the state of Illinois. Mr Grant is a former adjunct professor of law at Chicago-Kent College of Law and a former chairman of the Corporate Tax Division of the Chicago Bar Association. Jackie's Review: I found this manual to be of great benefit in future planning for my child with Autism. The authors cover many important topics, including public benefit programs (SSI, SSDI, Medicare, Medicaid), taxes and trusts, how to arrange payment for housing, recreation, transportation, and medical costs. Great care was taken to ensure that readers understand the intended message. Knowing what to expect and how to handle the important issues discussed in this book will make you more prepared to face tomorrow with your loved one. 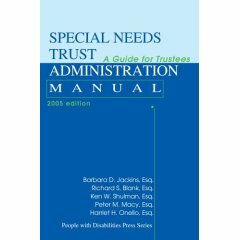 I recommend this book to anyone who wants to know more about special needs trust administration. I would strongly recommend making this purchase before hiring an attorney. Its affordable price makes it an easy, yet important, purchase decision that will give you the vital background and operations information that you will need throughout this process. For More Information: Order online through Amazon.com at http://www.amazon.com/gp/product/0595331068/ref=pd_bxgy_img_b/104-1143751-2051165?%5Fencoding=UTF8. About the Authors: Barbara D. Jackins, Richard S. Blank, Peter M. Macy, Harriet H. Onello, and Ken W. Shulman are all Massachusetts attorneys. Their individual practices, which are located in the Greater Boston area, focus on estate planning, Medicaid planning, public benefits, and trust administration. They are all experienced speakers and writers on disability related topics.